Last Blast of Summer...Labor Day Weekend! It's theLast Blast of Summer...Labor Day Weekend! It's the perfect time to get the whole family together and explore nature at it's finest at our natural attraction at the Lake of the Ozarks. Tours will be leaving every few minutes and we hope to see you at our cave at the Lake of the Ozarks over this long holiday weekend. While Labor Day Weekend is the "unofficial end of summer" if you can't make it, don't sweat it because we will still be open even after the summer season is over. Check out what will be happening here at Bridal Cave over the holiday weekend. Labor Day weekend is the unofficial end of Summer and lots of area attractions close down but Bridal Cave is open year round! As a matter of fact, Thunder Mountain Park comes alive for the Fall season with our Fall Festival in October. Last year was our first year for our Fall Festival and our staff and guests had so much fun that we decided to make the Fall Festival an annual event here at Thunder Mountain Park. Check out all the fun we had last year and why you need to make visiting our scenic attraction at the Lake of the Ozarks a priority this October. The 30th Annual Shootout is Nearly Here! One of the most popular annual events at the Lake of the Ozarks is almost here! The Lake of the Ozarks 30th Annual Shootout and associated activities will take place August 18th-26th this year at Captain Ron's Bar and Grill located in Sunrise Beach, Mo at the 34.5 MM. Your favorite cave at the Lake of the Ozarks has all the details for the Shootout right here! Photo Credit: www.FunLake.com Activities and Event Schedule Of course, the main event will be the big two-day powerboat racing but the Shootout is so much more than just the race. Be sure to join in on the entire week's activities for the Shootout. Check out the event schedule below. MONDAY, AUGUST 20, 2018 Treasure Hunt for All Ages at Captain Ron's—Lots of prizes! HUGE Announcement! We Need YOUR Help! As many of you have heard we recently acquired the old Der Essen Platz restaurant at the top of Thunder Mountain. The old building is currently being remodeled and we have plans to make this an intimate event center for wedding receptions, rehearsal dinners, family reunions and business meetings. The new design will be a Cracker Barrel inspired décor featuring memorabilia from Lake of the Ozarks, Ha Ha Tonka and Bridal Cave, and of course the million dollar view of the Big Niangua Arm of Lake of the Ozarks. Tentative plans are for a January 2019 grand opening. Built in the 1950’s the building opened as Red’s Roost and was known for the Thunder Mountain burger, chili dogs, and handmade shakes. 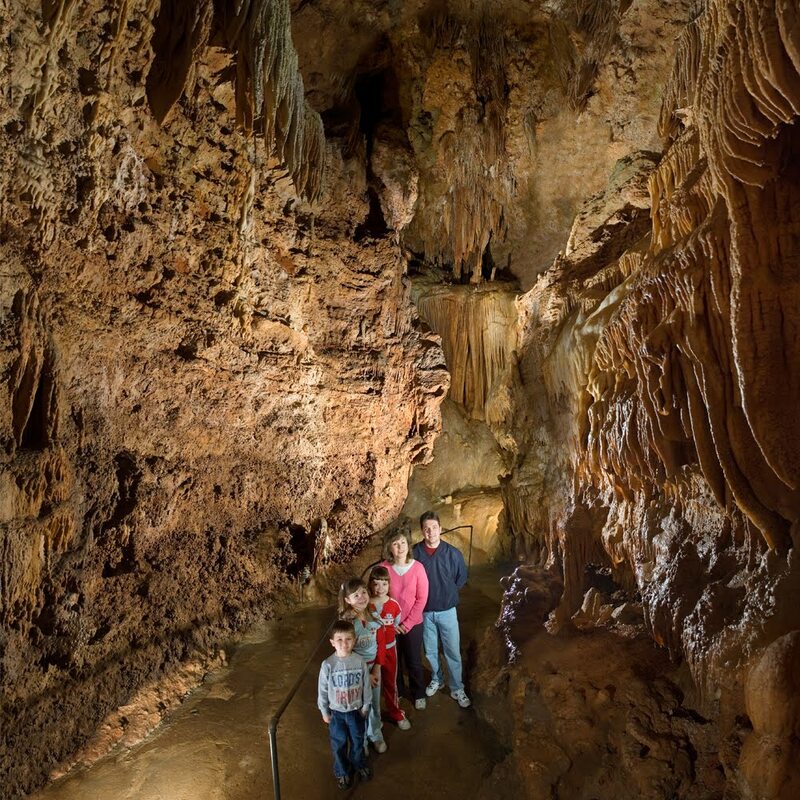 Celebrate National Family Fun Month at Bridal Cave! August is National Family Fun Month! With Summer coming to a close soon, it's the perfect time to spend some time with family. Why not celebrate at Bridal Cave because it only makes sense to celebrate National Family Fun Month at the best family attraction at the Lake of the Ozarks! Spending time outdoors with your family is a great way to unplug and enjoy time together. Bridal Cave offers several ways to enjoy some quality time with your family. Panning For Gemstones Kids (and adults!) LOVE panning for gemstones in our sluice. All you have to do is purchase a bag of sand inside the gift shop and take it outside to our sluice and pan for a variety of rough cut gemstones! The kids love finding treasures in the sand and the best part is this fun activity doubles as a souvenir! Depending on which bag you choose, you will go home with a variety of Emeralds, Fools Gold, Amethyst, Garnets, Sapphires, and more!